Here goes then. A little blog for fun. 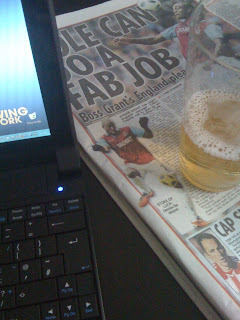 I'm settled down with a beer to watch the West Ham game. Some "As Live" thoughts on the beer I drink and the game as it unfolds. 13:59 Kick off after the break. The beer in the picture is a homebrew that's just reached condition. 4% with a load of chinook and cascade. Pretty decent, I think I've got the water treatment about nailed now. 14:01 Resting Demba Ba? Is that dodgy knee finally becoming an issue? Why the hell is Upson still wearing that captain's armband? Two words: Scott Parker. 14:04 Nice save Robert Green! A goal there? That's the last thing we needed. 14:08 This homebrew is pretty decent. The bitterness is huge but it doesn't linger. Hop flavour is almost all coming from the dry hop. In other news, ITV1 in HD rocks. 14:13 Booorrriinnggg! How can anyone be a fan of the way Stoke play? One down. 14:20 West Ham just need to calm down, hold the ball up and look to go forward. It feels like they're panicking a bit. 14:24 Some ridiculous acting from Obinna. Goes down like a lead weight, rolls around like he's been shot in the gut, only to pop up immediately as soon as the ref shows him the yellow card. I hate this side of football, you don't get this in cricket! 14:32 GET IN!! Great finish. Well controlled (with the shoulder ... or possibly arm). 1-1. 14:38 An injury on both sides just as the game starts to break loose and become a bit more exciting. I can hear the away fans singing bubbles. Goal-machine-spector is now on the field. 14:51 Half time and scores level. West Ham's goal was a tad lucky, but I think the score line probably reflects the way it's gone so far. 15:07 Second half has kicked off and Stoke have a penalty for a blatant dive. Scott Parker plays by the rules, simple as that, blatant dive. How much of that decision was down to the hand ball call in the first half? 15:07 Justice is done. Rob Green, beautiful penalty save. Get in there! 15:10 I found a beer during the break. It's something I picked up a couple of weeks back from the awesome Cask Pub and Kitchen in Pimlico. 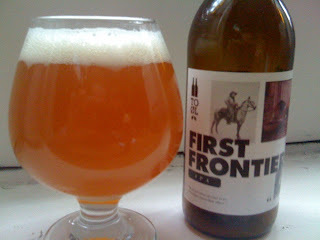 First Frontier IPA from the Danish brewery To Øl. 15:17 So, I don't know anything about this beer. I was told that the brewers behind it were apprentices at Mikkeller. The label says it's and American IPA at 7.1%. The hops are warrior, centennial and simcoe. 15:25 This beer is interesting. The aroma is packed with perfume and floral notes. I'm getting some ripe apricot flesh and some grapefruit in the background. It reminds me a lot of the hoppy Italian craft beers I've had. Birra del Borgo Re Ale Extra, Toccalmatto Zona Cesarini, that sort of thing. They all share a floral, perfume note that I've never had in an American beer. 15:26 And we're back to 2-1. This must be quite a game for the neutral. 15:31 I think it's yeast. This beer has been sitting still in my fridge for a fortnight and I poured it carefully to leave the sediment behind, despite that though it's really hazy. The main flavour I'm getting is very similar to the taste of US05 yeast that's just had beer racked off it after primary fermentation. 15:42 Fearing the result a bit, my mind has started to stray. Found this wonderfully abstract video on the To Øl website. 15:50 West Ham have a blatant penalty turned down and then hit the crossbar shortly afterwards. I think that cancels out any good luck in the first half. 15:53 Getting lots of yeast and apple now. Maybe this beer is slightly oxidised. 16:00 Well, looks like that Wembley day out will have to wait another year. 2-1 Stoke, a disappointing result and a slightly disappointing beer in First Frontier IPA. I love the colour of that beer! Shame it didn't sound too great. Shame about West Ham too. You should've watched the rugby, that was much more successful! they like their stop motion video's . The colour rocks, it's that glowing orange that Thornbridge Halcyon has .. almost luminescent. I think the videos and branding are great. 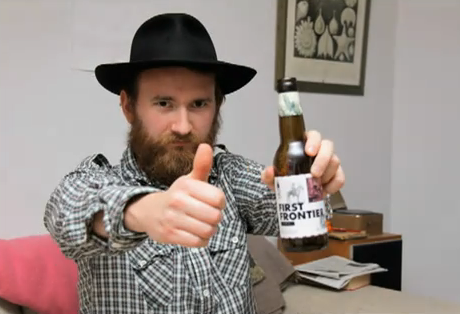 It's a shame the bottle I had didn't quite live up to that, but the brewery clearly has a lot of potential.